Well, here’s one for you. BUT, it’s not your usual oh-so-romantic friendly vampires that you are familiar with! Senior Charlie Brewster (Anton Yelchin) finally has it all—he’s running with the popular crowd and dating the hottest girl in high school. In fact, he’s so cool he’s even dissing his best friend Ed (Christopher Mintz-Plasse). But trouble arrives when an intriguing stranger Jerry (Colin Farrell) moves in next door. He seems like a great guy at first, but there’s something not quite right—and everyone, including Charlie’s mom (Toni Collette), doesn’t notice. After witnessing some very unusual activity, Charlie comes to an unmistakable conclusion: Jerry is a vampire preying on his neighborhood. Unable to convince anyone that he’s telling the truth, Charlie has to find a way to get rid of the monster himself in this Craig Gillespie-helmed revamp of the comedy horror classic. 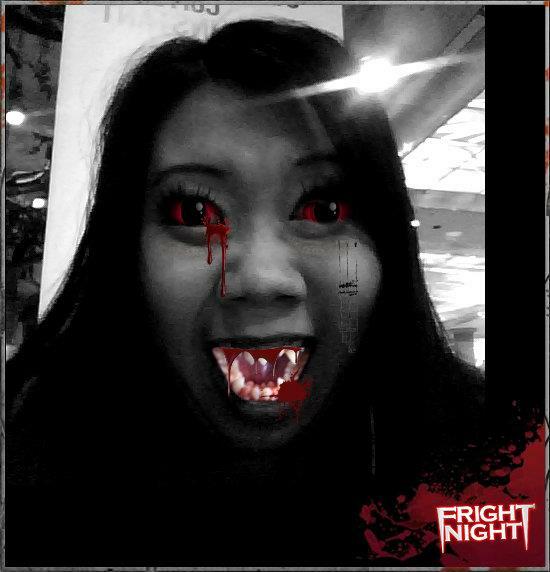 All you have to do is to take a photo of yourself, upload it on the “Fright your friends’ album, tag your friends in that photo, The Grand Prize winner will win a specially printed photo album of their “frighted” friends and 20 pairs of complimentary Fright Night movie passes!